Appalachian Mountain Roots: The Great Debate: How do you like your grits? We woke up to snow this morning! I heard the weatherman mention that we might get some but I figured it would miss us as it does 9 times out of 10. As of right this moment (Friday @ 9AM) we've gotten at least 2" and it's still peppering down pretty good. 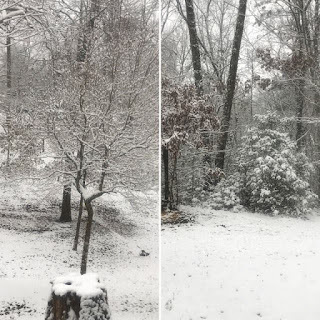 Front yard on the left and backyard on the right. For some reason, snow makes me want to cook. I usually wake up a little easier (and earlier) once I notice that it has snowed. Just think of everything I could accomplish if I lived somewhere like Alaska. Ha! 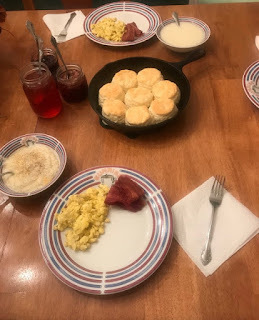 Anyway, I made some homemade buttermilk biscuits, scrambled eggs, turkey bacon (I know, it was on sale), homemade cherry, peach, and strawberry rhubarb jellies and jam, and grits. must have never experienced hot buttermilk biscuits. Grits are a subject that we debate about in this house. I like mine a little thicker with cheese, my husband (Jason) likes his soupy with butter and sugar, and my son (Dude) doesn't like them at all. When Jason and I first got married, I remember fixing cheese grits just because I like them and we always had savory grits growing up. We sat down to eat and Jason got up to get some sugar. 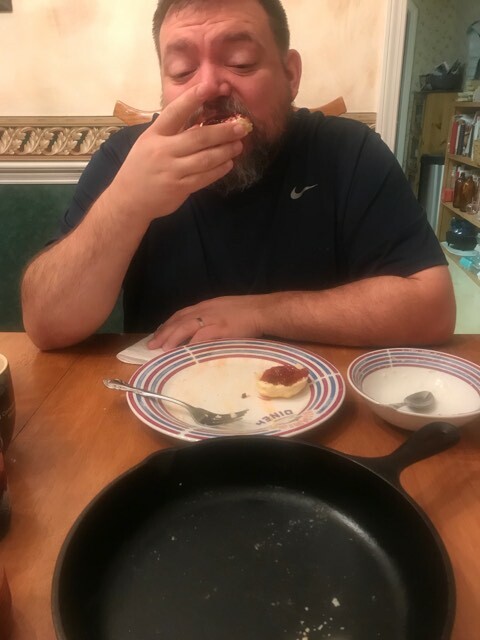 I was horrified to see him add some to his grits and he was horrified after taking the first bite and realizing that their was cheese in them. I told him that sugar is for oatmeal and cream of wheat, not grits. He begged to differ! I had never known anyone to eat grits with sugar. It's still something that we joke about whenever we have them. Now I'm curious to know how everyone else eats their grits. Do you like them savory with butter and salt or cheese? Or do you like them sweet with butter and sugar? Let me know! I'm sure he'll be checking for comments as soon as he finds out that I wrote a post about grits. was lucky enough to reach for the last one!